Afrah Nasser's Blog: Yemeni Grassroots' Efforts Surpass Governmental Efforts - Please support the grassroots! Yemeni Grassroots' Efforts Surpass Governmental Efforts - Please support the grassroots! *Firstly, let's define what does hanger in Yemen mean. It means that there is food but people don't have enough money to afford it. So, it's not a famine. It's a deeply-rooted economical crisi for millions of Yemenis. To be frank, I don't blame Saleh and his family only. There are several groups inside Yemen who never and will never work in distributing wealth equally and fairly among the people, especially for those who are needy. The result of that is .. hunger among people who can't afford buying food. And the other sad thing is, Yemen receives bilion of dollars from the US administration in the name of "fighting al-Qaeda" while the people are starving to death. In Iraq, for example, the government receives a huge aid and the government ends up giving the people basic food for free!! I guess Yemen's fault was that it doesn't have OIL. *Secondly, after defining hunger in Yemen. I'd like to talk about Yemen's economy. Why hasn't it drastically collapsed? I'm not an expert on that but from my humble observation I believe Yemenis abroad are sending liquidity to their relatives inside Yemen which helps them to a large extent. If you think about it, the Yemeni currency has not collapsed like how it's in Lebanon or Zimbabwe where people don't use their own currency anymore; mainly dealing with dollars. Yemen's currency is still doing ok.
Well, no doubt, Yemenis abroad represents a foundation for people inside Yemen to remain walking like a normal person. If you need to support them, please contact them through their Facebook's page here and here is the facebook account for one of the group's leaders, Mohammed Mutahar. A very active group lead by the social activist, Taha Mothana. You can get in touch with the group through it's Facebook page here or Taha himself here. You can read their latest social development project here. A youth-led initiative for collecting donated clothes and distributing them to vulnerable groups. You can get in touch with them through their facebook page here. Working on several charity projects. Their recent one is to help in distrbuting food to fasting people. This is their Facebook page and their blog. One of the most active groups working for Yemen. As an extension to their last year campaign, this year they continue a campaign to needy families. The YPP is partnering with Hemmat Shabab, to provide desperately needed direct assistance to Yemen’s most vulnerable citizens. Through the Yemen Peace Project’s Fast for Yemen campaign, you can help feed Yemen this Ramadan. Please read more about that here. Those were a few groups of the massive initiatives/groups working on charity in Yemen. I find it fascinating how the social bond among the Yemenis surpasses any hardships. I wonder, what the heck the government is doing?! I say this humorously & semi-seriously, Yemenis don't really need governmental assistance. In fact, the government is only stealing the nation's wealth to their pockets >> you may name it corruption. What I'm trying to say, Yemenis survive hardships because there is a huge & remarkable social bond between them. That doesn't mean that we should stop foreign aid but I'm just acknowledging Yemenis' fortitude. Please feel free to support any of the groups mentioned. I know that many Yemenis in the USA, UK and Saudi Arabia follow my blog. So please support Yemenis' efforts inside. And I wish you a happy and blessed Ramadan! 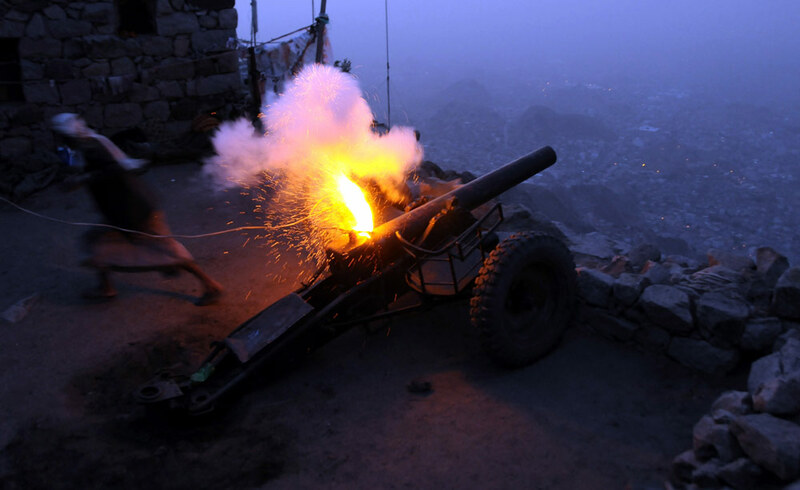 A Yemeni man fires a cannon to mark the end of the first fasting day of Ramadan in the southern city of Taiz. Anti-government protesters attend the Iftar meal in Sanaa, Yemen, on the first day of Ramadan.